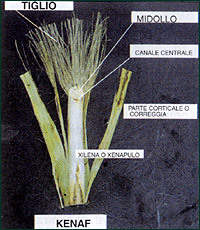 In industrial cultivations, the kenaf stem is erect, straight, with a cylindrical cross-section. It reaches a height of from 1 to over 4 metres, is entirely green or green with reddish speckles, or reddish or red. If the plant is on its own, or widely spaced such as at the edges of plantations, it may branch vigorously. Hemp never has a red stalk, but only green that at maturity turns yellow. At the base of plants that develop considerably, the medullar channel gets smaller and there may be no pith.